Ex-Hawick winger Darcy Graham celebrates scoring Scotland's fourth try agaisnt England at Twickenham (photo by Laurence Griffiths/Getty Images). After Darcy Graham’s superb contribution the previous week against Wales, fortune could have gone one of two ways for the ex-Hawick winger. Thankfully, he found himself with a key role in one of the greatest contests of all time against the Auld Enemy on Saturday. The Borders lad scored two tries as Scotland almost wrenched victory from an England side which had been 31 points to the good. It was a superb game on which to conclude this year’s Guinness Six Nations but, although Scotland retained the Calcutta Cup, the long stretch without a win in the tournament at Twickenham will continue at least until 2021. Graham slowly came into the game midway through the first half, albeit in a more defensive role. He ominously intercepted a forward move by England fuullback Elliot Daly in the 28th minute and made a fine tackle on the same player at the end of the first half, although he missed one seconds later on Jonny May. Graham brought the Scots back to 31-12 in 47 minutes with a try after receiving the ball from Sam Skinner. 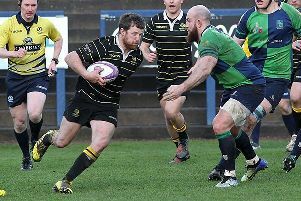 Head coach Gregor Townsend – ex-Gala star – later made four changes, with Jedburgh’s Greig Laidlaw among those coming on in the 57th minute. Almost immediately, Graham scored his second try when scrum half Laidlaw made a kick pass to Sean Maitland, whose left-hand spin pass was collected deftly by Graham to go over on the flank for Scotland’s bonus point counter. Laidlaw missed with the goal extras – although he converted Scotland’s two other tries – and also unfortunately missed a penalty at 31-31, awarded after Owen Farrell had an arguably shoulder-led collision with Graham. 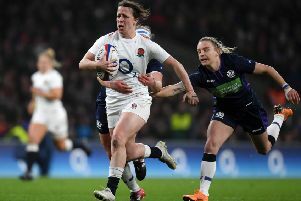 Townsend told the BBC afterwards he was “more than proud” with the Scots’ comeback after an “outstanding” display by England in the first half. “It’s amazing what can happen in a game of rugby,” he said.